The Three Rs: Rants, Raves and (Occasional) Reflections: MIA...But For A Good Reason! I don't know if anyone's noticed or not, but I've been neglecting my blog for the past few weeks. 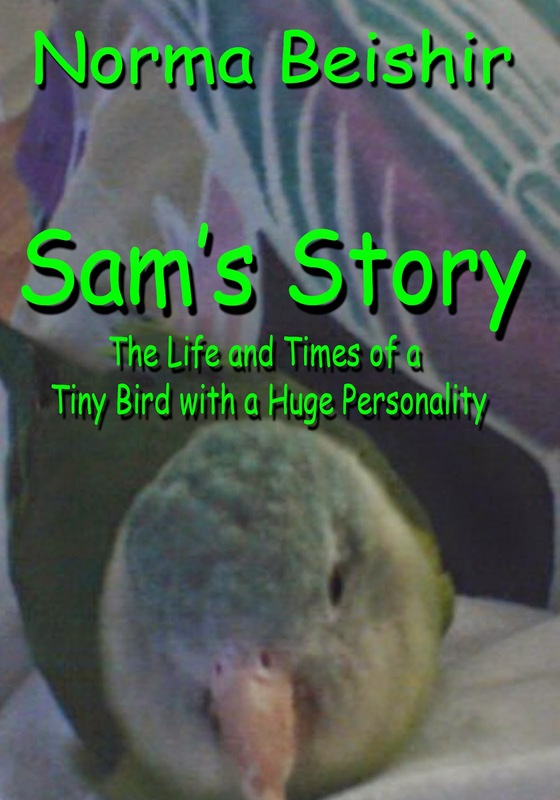 I love blogging...but most of my time has been going to finishing Sam's Story: The Life and Times of a Tiny Bird with a Huge Personality. I've also been developing a rather unusual promotional campaign for it. So that left me with a question: how do I sell this book without sounding like I'm just full of BS? What's worked so far has been what I call the Anti-Marketing method. I get involved. I go to the websites and Facebook pages of TV shows and movies I've seen and give my big mouth a free rein. I go to TV news pages and comment on stories that make me want to throttle somebody. Usually, I generate enough attention to make people curious. I don't often mention that I'm an author. It's not necessary, and would probably backfire anyway. But for Sam's Story, I wanted to do something different. The idea that came to me is one that, to my knowledge, hasn't been done before...but should work very well for this kind of book. We'll see. When the first "ads" start to appear here and on Facebook in the next couple of weeks, let me know what you think! I celebrated an anniversary over the weekend, too--On April 26th, 1985, I sold my first novel--Alexander's Empire, which Berkley later retitled Dance of the Gods (and I retitled Alexander's Empire for the ebook edition). That was a real high for me--not only did I sell my first novel, every writer's dream, but it sold for a lot more than I ever expected to get for my first book--and of the twelve publishers my agent sent it to, eight made offers. See why I never forget that anniversary? PS -- Check out William's latest installment in the adventures of Mountie Lars Ulrich, as well as photoblogs from William, Bob and Grace. Norma, I've noticed you being MIA. I have been MIA pretty much with Facebook and Twitter. All the author stuff is overwhelming and I don't care to bug peeps either about how great my books and stories are. And too, I've been working by hand on Killer Stilettos and making Time on Her Side a full novel or novella. Looking forward to seeing the "ads." The book will be good, of that I am sure. @ Shelly: I noticed you haven't been around Facebook much. How are your covers coming along? @ Carole: It's a little unusual for a book promo, but has been very popular in social networking. It works better for comedy than for a more serious genre. Thanks for the ego stroking! Norma, congrats on the anniversary! Let us know how the Sam campaign goes! @ Cheryl: You'll know. It'll be easy to see! Knowing what I do of what you have in mind, I'm looking forward to it! And that's a good anniversary to mark! @ William: You're one of two people who knows the details! I'm sure your book about Sam will be a great success. @ Eve: We shall see...I hope you're right! A very good anniversary mark. Looking forward to seeing you ads. Wishing you all good on this adventure. Self-promotion is not an easy thing. Totally understandable as to how you feel about it. I too noticed you were not blogging but you were commenting so I assumed you were working on your book. I woke up this morning and what was my first thought was Sam's story ! @ Gayle: That made my day! Now, you have to give Hamish and Watson a book! I have a very rough draft of a book for them but I have to really sit down and finish the book i have started and stopped several times on my first Scotty Kirby. I can see why the 28th is so important Norma what an amazing result for your first novel.. publishers recognise talent. We should link up on facebook..
@ Hilary: For some reason, I'm having a lot of trouble getting your blog--I've added it to my blogroll (or tried--look at the sidebar! ), I've subscribed, and nothing works. So I bookmarked it on my Kindle! @ Grace: I agree. We should link up on Facebook!